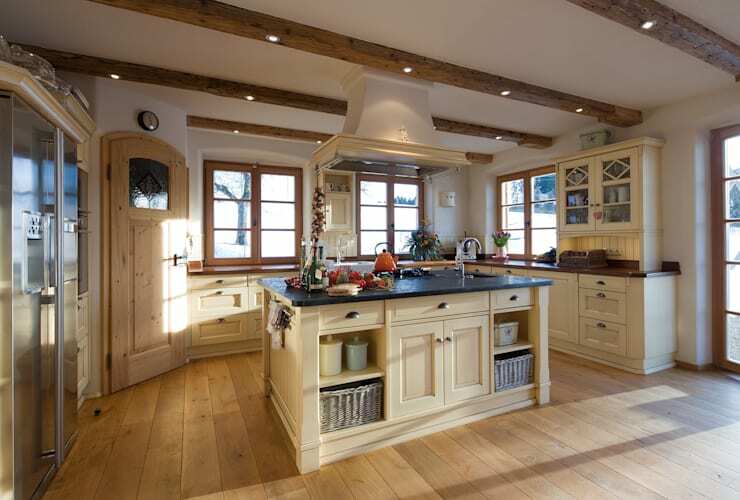 There are many different ways an L shaped kitchen can be utilised. It especially works well with a small or medium spaced kitchen space. This type of kitchen also accommodates an island and other necessities like permanent kitchen fixtures like stove and sink. The island is very useful both for preparation of meals and for added storage. One side of the ‘L’ can be used as an open counter space and the other side leading to the dining or living room. These kitchen spaces are very functional and attractive. They are useful for cooking and cleaning and for small gatherings to eat and converse. One of the major benefits of the L shaped kitchen is that it suits homeowners who do a lot of cooking. It also helps maintain a work triangle where in there is an efficient spacing between the refrigerator, stove and sink which are the major elements in a kitchen. 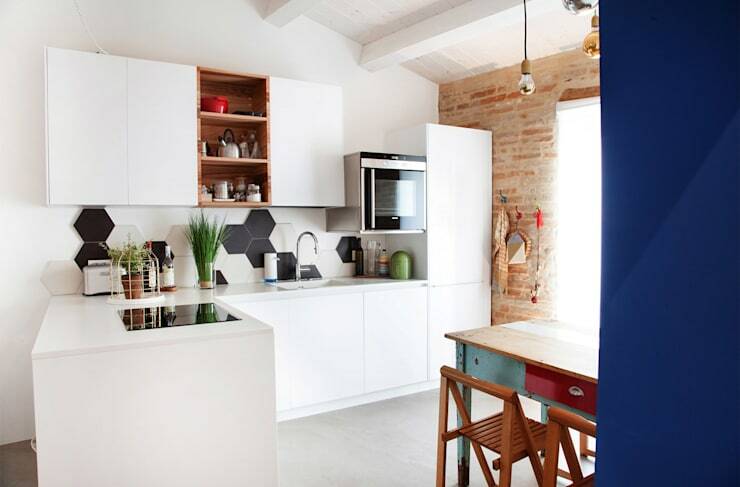 The L-shaped kitchen generally uses adjacent walls. 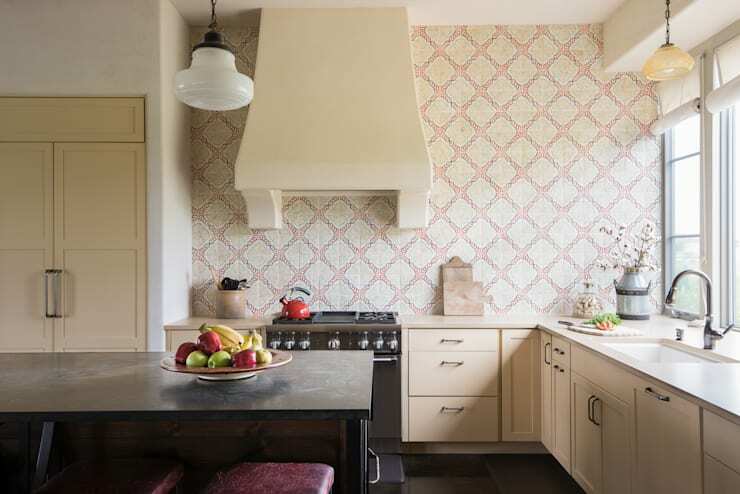 Some uses both walls and have upper and lower cabinets on each wall of the L. Some other designs have only one standing wall where there is an open countertop. While one side features cooking elements and cleaning, the other portion has sufficient storage space and accessories. Having the sink in the external facing wall generally creates a good design as the plumbing will be accessible and it will be hidden behind the cabinets. 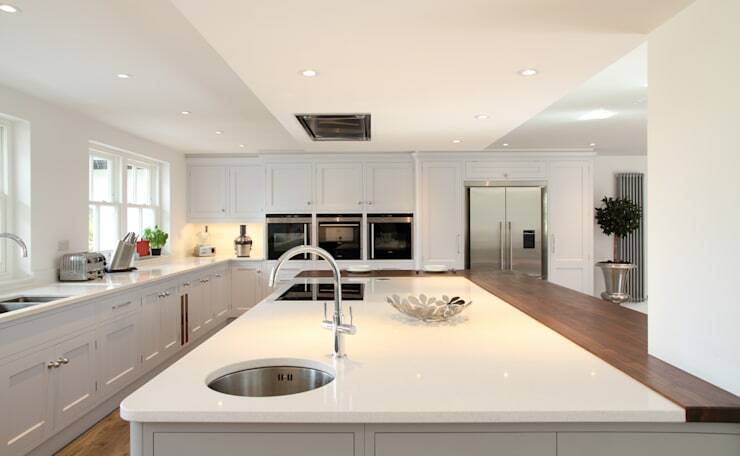 But the plumbing can also be reconfigured so that the sink can be placed in the island creating extra space for cleaning and food preparation. Another advantage of this layout is that the L shaped kitchen accommodates multiple cooks easily and allow for entertaining guests. The room can also be turned into an eat-in kitchen with tables and chairs. The kitchen needs to be functional at all times. Style comes second but it cannot be ignored. Every element in the kitchen has to be perfectly balanced. 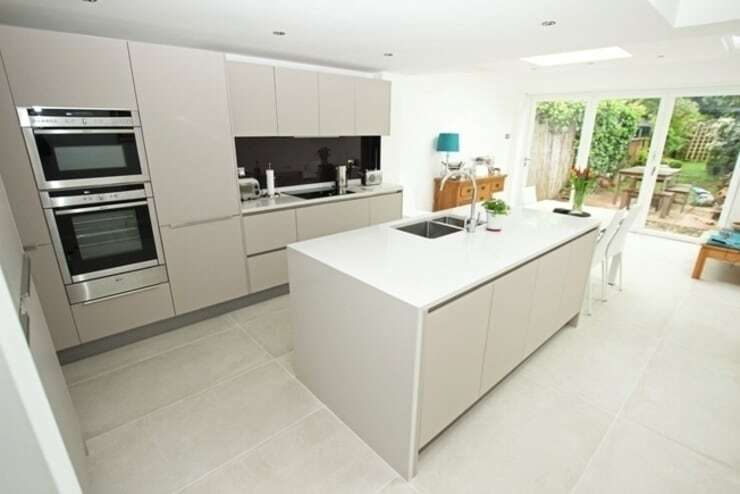 Being a part of the open plan L shaped kitchens have become very common and it is also very practical. They not only have ample counter space, but they also have a sufficient storage space. 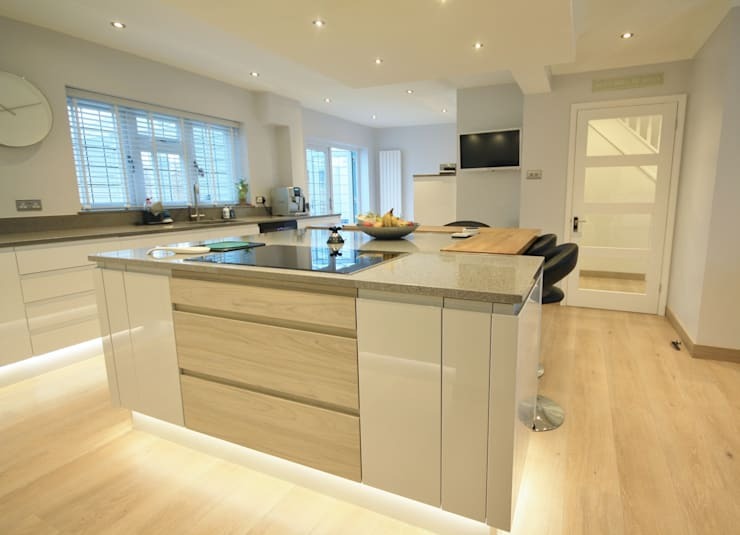 If there is an island in the kitchen, it can also be fitted with storage space all around. Storage is available above the counter tops, the island and the external wall. So the kitchen is able to accommodate a lot of things. There is sufficient space for utensils, kitchen tools and equipment. This L-shaped design has been create by Porto Sant’Elpidio, Italy-based fine architects Ossigeno Architettura. The main advantage of the L-shaped kitchen is that it even allows multiple cooks to work in the kitchen without being overcrowded for space. As there is sufficient preparation area and a sink people can move about easily without coming in the way of the others. In larger spaces, the dining space accommodates more people who can sit around the kitchen for a conversation. It even enables small. There is also a sink away from the cooking area so multiple people work easily and work and cleaning gets quickly done. There is also a possibility of having multiple sinks in the L-shaped kitchen. The sink obviously has to be near the plumbing. The sink sees more action in a day and it should also have easy access to the stove and refrigerator as well as the counter tops. If the placement of pipes in the kitchen is not right then plumbers should be hired to relocate the plumbing to accommodate the sink at the right place. If the work triangle of stove, sink and refrigerator is not balanced then people would be coming in each other’s way. There are different types of counter top options. Granite can be used and it is available in a host of colors. They are also durable and able to handle wear and tear easily. Acrylic and polyester counter tops are also popular choices in recent times. It is non-porous and is relatively maintenance free. The installation is seamless and so there are no cracks to trap dirt and debris. The disadvantage of this material is that it looks artificial but the price is that of natural stone. It cannot handle hot pans and sharp knives. Stone, quartz and marble are some of the other types of counter tops. Laminated counter tops are one of the most affordable counter top materials and are a good choice when working on tight budgets. It is low maintenance and easy to clean. The downside of using laminate is that it can’t be used with under mount sink and difficult to repair if its gets damaged. The L-shaped kitchen is a good choice but in tight spaces it is better to avoid an island as it would make the kitchen look smaller and be too crowded when multiple people want to use it. People who like to entertain will have to opt for a larger kitchen where they can accommodate a fair sized island that would serve their purpose. An island should be at least four feet long and two feet deep. It should also have room for people to move about. Unless the kitchen is at least eight feet deep and 12 feet long, the island should not be considered. Kitchen islands can waste a lot of space if placed in the wrong spot. Sometimes a square island is better than a rectangle one. If there is less room for a sink in the L shaped area, the sink can be placed in the island. Though it may make a tight work triangle, it will still allow for entertaining. A small island may work in a tight space and there will not be any seating, but an extra sink can be a possibility. In a large kitchen both square and rectangle island will work with overlapping work triangles and multiple cooks to work at the same time. You may read 8 exquisite L-shaped modular kitchen designs to get more ideas.